It's baseball season, spring recital season, everyone get outside because the weather is finally nice and the flowers are blooming after a long and dreary winter season. There is absolutely no time to cook and sit down to dinner unless you want to eat at 10:00pm. Which means how the heck will I get everyone fed without making myself absolutely nuts? I could just eat crackers and cheese, pour myself a glass of wine (counts as a fruit/vegetable, right?) and be done with it. But my children look at me with their big hungry eyes and rub their growling tummies. Long before any sane person should even be thinking about an evening meal, it happens every afternoon just as the bus doors close. As they burst into the house, they yell, "What's for dinner?" Short of offering them something prepackaged and microwavable, there is not much I can do unless I want to be cooking dinner at 800pm and washing dishes from 9-10pm. Everyone knows I like to be in bed far before that snuggling up with the same book I have been trying to get through for the past six months. Oh the exhaustion of motherhood! I have reread the same page over and over again, before I drift off to sleep midsentence. Of course, there is the trusty Crock Pot. However, my picky eaters don't really like soup or stew. A meat entrée usually still needs some starch like mashed potatoes or boiling up a pot of rice and maybe even the addition of a vegetable....I need it to be easier than that. Even rice takes 30 minutes on the stove top. In a moment of sheer genius, I placed skinless, boneless chicken thighs and 1/2 a bottle of BBQ sauce in the crockpot and set it on low. Stopped at the store for sandwich rolls and a bundle of fresh kale. Yes, that's right. KALE for children who always complain about what is on the plate. It's shocking, I know that my picky eaters might even try a kale. But I tricked them. I baked kale chips. Chips sound like junk food, like something forbidden. So at least they might try it. Now here they are devouring the whole bowl before I can get a handful for myself. Even more surprising is that I actually like kale chips. 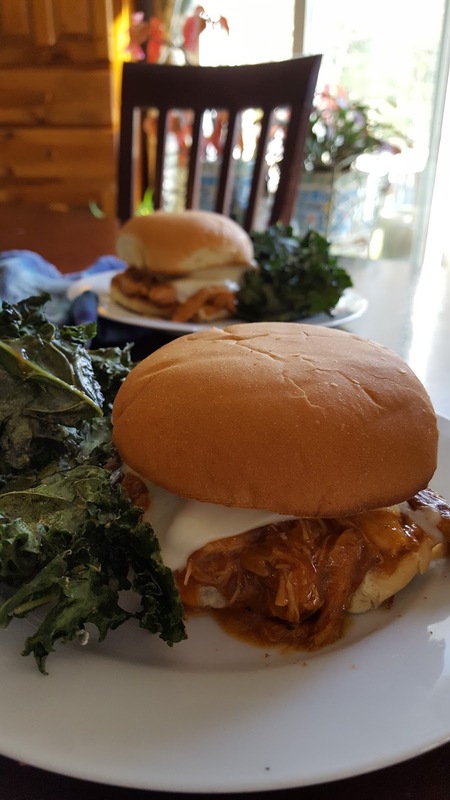 I have always hated kale, was angry about those "Eat More Kale" t-shirts and bumper stickers. Yes, I have finally came around to the kale craze. Late to the party but ready to celebrate. Especially because kale chips can be made ahead and served at room temperature. I actually left them on the cookie sheet I used to bake them right on top of the stove. Crockpot on low with the BBQ chicken inside. Now I feel like super mom. Now, I am ready to watch a two plus hour little league game and know that I can crawl into bed to try and read, uninterrupted by whining and complaining while my people devour their dinner. Spray inside of Crock Pot with cooking spray. Place chicken in a single layer inside Crock Pot. Pour BBQ sauce over chicken. Make a slurry out of cornstarch and cold water by mixing both together until smooth. Add to BBQ sauce and swirl to combine. Cover Crock Pot and cook on low for approximately 5 hours. Once cooked, shred chicken and stir back into sauce. Serve on toasted rolls or ciabatta bread. Top with melted cheese, if desired. Preheat oven to 375 degrees. Spray 2 cookie sheets with cooking spray. 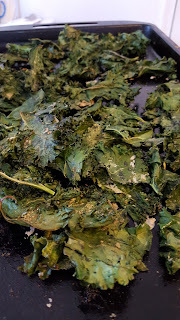 Remove kale leaves from stems and rip into small pieces about 2"-3" long. 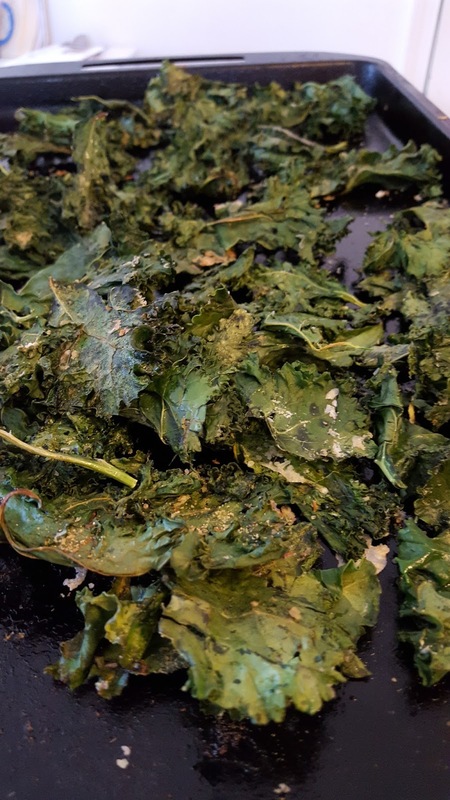 Scatter kale pieces in one layer over the cookie sheets. Spray kale leaves with cooking spray. Sprinkle with salt, pepper and garlic powder. Bake kale for 15-20 minutes until crisp and dark green and slightly browned on edges. Serve immediately or leave out for people to snack on. Great with cocktails! !